On Thursday night, Francisco Covarriubias will help discover how many of his neighbors are living on the streets. For the third year in a row, he is giving his time to let them know they count. “I was working in an organization based in Skid Row. Every day we saw hundreds of homeless people right outside our offices” Francisco said. “Even the people we served who had homes were often a single paycheck away from the streets. When I heard about the count, I knew I wanted to be involved. From January 23-25, Francisco and thousands of other Angelenos will take to the streets to measure the scale of Los Angeles County’s homelessness crisis as part of the Greater Los Angeles Homeless Count. According to the most recent count, nearly 60,000 of our neighbors go to sleep homeless every night. Over the course of a year, it is estimated that as many as 150,000 Angelenos will experience homelessness, enough to fill the Rose Bowl, the Staples Center, the Forum and the Hollywood Bowl. They are men and women, children and the elderly, individuals and families. Their stories are as diverse as they are. Some are veterans or former foster youth. Some suffer from mental illness or substance use issues. Some are fleeing parental or domestic abuse. 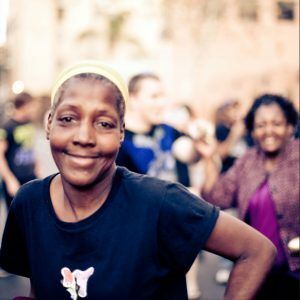 Launched in 2005 by the Los Angeles Homeless Authority, the Greater Los Angeles Homeless Count seeks to understand these stories – who they are, where they live, what factors led them to homelessness and what approaches can help them escape it. Last year, more than 6,000 people volunteered to go out on the streets and individually count and interview homeless Angelenos, a process vital to serving the needs of our homeless neighbors and ending the crisis facing Los Angeles. These increases are all the more stark when factoring in that 2016 saw more than 14,000 people leave homelessness and enter permanent supportive housing. This approach, which combines long-term affordable housing with services, is incredibly effective at helping people get and stay housed, but up till now, the supply of new units has not been able to keep up with the numbers L.A. residents entering homelessness. “People need to realize how easily we ignore these individuals or drive past them every day. When you slow down and pay attention,” Francisco said. “You realize how many more people are sleeping on the streets. The 2018 count is more important than ever. A year ago, Angelenos from every community, background and income level came together to make a lasting impact on L.A.’s homelessness crisis. Proposition HHH and Measure H will bring billions to fund housing and services individuals and families overcome homelessness. The geographic and demographic data collected by Homeless Count volunteers will be vital to ensuring they make the greatest possible impact. Everyone is affected by the homelessness crisis, and everyone benefits when our neighbors have shelter, support and the services they need to thrive. But we can all play a role in ending it. However you choose to get involved, be it volunteering to take part in the Homeless Count, donating to homeless service organizations or simply reaching out to someone you see on the street and letting them know they’re not invisible, you are part of the solution. To volunteer for this year’s Greater Los Angeles Homeless Count, visit theycountwillyou.org. If you or someone you know is experiencing homelessness, you can find help by through the Los Angeles Homeless Services Authority website or by calling 211.